We carry Allergan Fillers in our office. 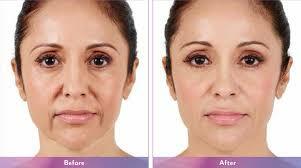 Allergan fillers are specifically engineered dermal fillers. They are designed to address specific patient concerns – including age related volume loss in the cheek area and lip fullness – without invasive surgery. The Juvederm Ultra filler is preferred for the treatment of softer facial lines and folds. It’s used around the mouth and lips and is good for lip augmentation and treating smile lines. Results typically last for 6-12 months. The Juvederm Ultra Plus filler is a step above the Juvederm Ultra filler. It’s more potent and best for treating more moderate to severe lines and folds. Parenthesis and marionette lines can be reduced with Juvederm Ultra Plus. For most people, the results will last for about one year. The Vollure filler is best for both fines and deep folds. It’s often recommended for parenthesis lines, marionette lines, and volume loss. It’s a great choice for treating cheek hollows. Results generally last for up to 18 months. The Volbella filler is the preferred filler for achieving soft, natural-looking lip augmentation. It’s great for treating fine lines, smoker’s lines around the mouth, and under eye hollows. Results typically last for up to one year. The Voluma filler is good for contour and lift augmentation. It’s often used in the cheeks and jaw line. Results can last up to two years after treatment. Our experience and self-confidence may grow with age, but our skin’s youthfulness starts to fade. As a result, our appearance is no longer in harmony with our dynamic personalities and how we feel on the inside. 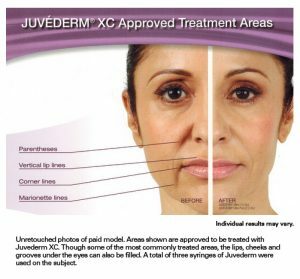 In order to understand how skin rejuvenation with JUVÉDERM® is possible, it is important to understand basic skin anatomy and the aging process. Skin is the largest organ of the body and is made up of approximately 70% water. As a barrier, it protects the body against the invasion of microorganisms and the loss of fluid. It also helps regulate body temperature. The aging process is a natural process in which cells begin to renew themselves more slowly. For your skin, this means less collagen and hyaluronic acid to support and fill out layers of skin. Environmental effects, pollution, sun exposure, stress and smoking can all increase this effect. Over time, this combination of factors contributes to the three D’s of aging. Skin Deterioration describes the appearance of facial skin over time and is often related to past sun exposure. An irregular skin complexion can make us appear older and less healthy to others. Facial Deflation is due to normal aging changes in our face where certain deeper facial structures change over time, such as the fat pads, bones and teeth in our face. Loss of the normal volume of youth over time makes us look older and less vibrant to others. Facial Descent often follows loss of facial volume and describes the falling of our eyelids, eyebrows and jowl formation as we age. It’s like a tulip that, when young and full of water, stands up; but as the water leaves the tulip, it droops. There isn’t more gravity acting on the tulip; it’s just that it’s lost its healthy volume. Our faces act the same way. This also makes us look older and less vibrant to others. Hyaluronic acid, a naturally occurring sugar that helps maintain facial fullness and elasticity in the skin, plays an important role in the way our skin looks, feels and functions. Hyaluronic acid retains water like a sponge, absorbing more than 1,000 times its weight. This helps to hydrate and moisturize our skin, improving overall appearance. As the skin ages and is exposed to environmental pollutants and ultraviolet rays, the cells lose the ability to produce hyaluronic acid. As a result, this causes wrinkles to form and our face to lose definition, balance and its natural shape. JUVÉDERM® helps to reduce the visible signs of aging by replacing hyaluronic acid to smooth lines, restore lost fullness, and keep your skin hydrated. **Are there any reasons why I should not receive any JUVÉDERM® injectable gel formulation? Do not use these products if you have a history of multiple severe allergies or severe allergic reactions (anaphylaxis), or if you are allergic to lidocaine or the Gram-positive bacterial proteins used in these products. Member of Brilliant Distinctions: Read about it HERE!